Is Yosemite National Park open year round? Yes, Yosemite National Park is open year round and has four beautiful seasons. Due to Scenic Wonders unique locations in and around Yosemite National Park and our popularity, we receive extremely high volumes of reservation requests daily for our properties during our peak seasons and unfortunately we are unable to accommodate everyone. Year after year we have to turn away hundreds if not thousands of potential guests from early April through October because we become sold out. There are many vacation rental and social media websites, print media, blogs, etc. all over the world that have listed our properties. We do our very best to keep our calendar on our website updated daily. We strongly advise that you do not wait until the last minute to make your reservations. Please try to make your reservations at least six to eight months in advance to assure availability during our peak seasons or consider visiting us during our off season period (November, January and March). Where and how do we check in? You check in directly to your home or condominium of your choice. When you arrive, there will be a key pad on the door, the combination for your stay is the last 4 digits of your phone number. To use, enter your code, you can then turn the deadbolt and enter. Please read the welcome binder on the kitchen table for information on the home and what to do in the surrounding area. If you have any questions during your stay you may call us at 209-372-4945. Our check in time is anytime after 4pm, check out time is 11am. Are wedding receptions or large groups/parties permitted in any of our properties? Sorry, no. Unfortunately, about 90 percent of the time that we have allowed wedding receptions or large groups to rent multiple properties, without fail, they turn out to be loud and uncontrollable, create excessive wear and tear on the furniture, stains on our carpets, broken chairs, broken screen doors, missing items, etc. We have been taken advantage of too many times to allow this to continue, so please beware! During our nightly patrol, if we should find any extra vehicles parked at any of our properties, other than what is allowed, or find any large group that exceeds the maximum allowable occupancy, Park Rangers or the County Sheriff's Department will be notified for immediate eviction. Please don't create an embarrassing situation for yourself and your family, and kindly respect our community. Is there a fee to enter Yosemite National Park? Yes, a $30.00 fee is collected by the Park Rangers at the entrance gates, which is valid for seven days. Do you charge cleaning fees? NO. For your convenience we do not charge cleaning fees. However you must leave the property tidy upon departure. Excessive mess or trash shall result in additional charges. Do you have internet access at any of your home properties? Please see individual property amenities. Do you have internet access at any of your Condominium properties? Sorry no wifi at the Yosemite West Condominiums Where are you located? How far are you from the main attractions? We have 3 ideal locations. In Yosemite West, only 15 minutes to Yosemite Valley’s Tunnel View and Badger Pass Ski Resort at an elevation of 6,000 ft enjoy cool summers and beautiful sunsets. In Wawona, close to the Merced River and Wawona Hotel, enjoy the Chilnualna Falls trail or the Mariposa Grove, a local market for last minute grocery needs. The Yosemite’s South Gate area, close to the Mariposa Grove, Nelder Grove, shopping, restaurants and beautiful Bass Lake. Our water is perfectly safe to drink, bath and swim in, but we recommend that you bring bottled water for drinking, due to the fact that our water has a high mineral content. If you have any doubt that you may not be able to make your trip for any of the reasons mentioned above, we strongly urge that you purchase trip insurance from Allianz.Ã‚ Since we don't require many of the fees that some competitors charge, for a very minimal cost you can insure your entire trip for a full refund if anything should happen. Are there any restaurants or grocery stores in Yosemite West? There are NO food services in Yosemite West, so please try to do your shopping before you enter the Park. You can shop in our neighboring towns of Oakhurst, Mariposa, Groveland, and Lee Vining, before you enter the gates of Yosemite National Park. Our closest restaurants and markets are located in Yosemite Valley and Wawona, which are both about a 20 minute drive. Do you have Air Conditioning in any of your rentals? See individual property amenities for homes with air conditioning. Do you have additional Park information? The Telephone number for the Yosemite Park Concessions is (209) 372-1001. Telephone number for road conditions and weather is (209) 372-0200. Do your properties have phones? Yes, all our properties have phones. You can make local calls free of charge, but you will have to use your own 1-800 calling card for long distance calls. Yosemite’s South Gate homes offer free long distance in the continental US. Do cell phones work in Yosemite? No, there is hardly any cell phone reception inside the park. Verizon may work in some areas. Housekeeping is not provided daily -- only prior to check-in. If you need additional housekeeping, please contact our manager. There will be an additional charge if you should need this service. Who do I call for assistance during my stay? You may request an iron or hair dryer upon arrival. What if extra guests join my group? What if my group exceeds the limit to capacity in the rental? Extra guests are not permitted. Our rentals are only allowed to have a certain number of guests do to maximum capacity zoning laws and fire standards. If extra guests exceed capacity, extra guests will be immediately evicted by law enforcement. No outside party guests allowed. Please see individual property amenities. Fine is $500 for brining a pet into a non pet friendly home or bringing a pet into a pet friendly home without prior approval. Do your rentals have fireplaces? How about firewood for the WOOD burning fireplaces? Yosemite West properties have complementary firewood, you may view individual property amenities for details. Check-in is anytime after 4 p.m. and check-out is anytime before 11 am. If you should arrive late after check-in hours and need help, there is a 24-hour manager available by phone, please only emergency calls after 10pm. Sorry, due to the size of our properties, and the complexities of cleaning and maintaining them, we cannot allow early check-ins or late check-outs. Please respect your fellow travelers vacation experience. Balances due are automatically paid 30 days prior to your arrival by credit card; everyone is paid in full 30 days prior to your arrival. You do not need to call us, unless we contact you for issues with your credit card. We do not accept checks. No, smoking is not allowed in any of our properties. What if I have to change my arrival date or rental unit? We do not allow last minute arrival date changes, unless you give us fair warning of at least a month; we may be able to do so months ahead of time. You may upgrade your rental at anytime, as long as it's available. Cancellation fees will apply. What if I bring an extra car, and my unit only allows a minimum? The maximum number of vehicles is listed on your properties amenities page, you cannot exceed the maximum amount of vehicles. Is there a meeting area or banquet room in the area to have a family gathering? No, we do not cater to large groups. Sorry, we unfortunately do not have any accommodations that fit handicapped requirements. You should be able to find lodging in Yosemite Valley; call (209) 372-1001. There are two hotels that will be able to help you, plus you'll have less of a commute to all the main points of interest. We do have some properties suitable for persons with limited mobility. Your own personal hygiene items and groceries if you wish to cook in your unit. Yes. Bug repellent is advised if you intend on being outside during dusk. No. Violators will be towed to the nearest town which is about 40 miles away. Can my relatives stay in their RV outside while I'm in my rental? No. Violators will asked to leave or be towed to the nearest town at owners expense. Is there camping in Yosemite West? No. 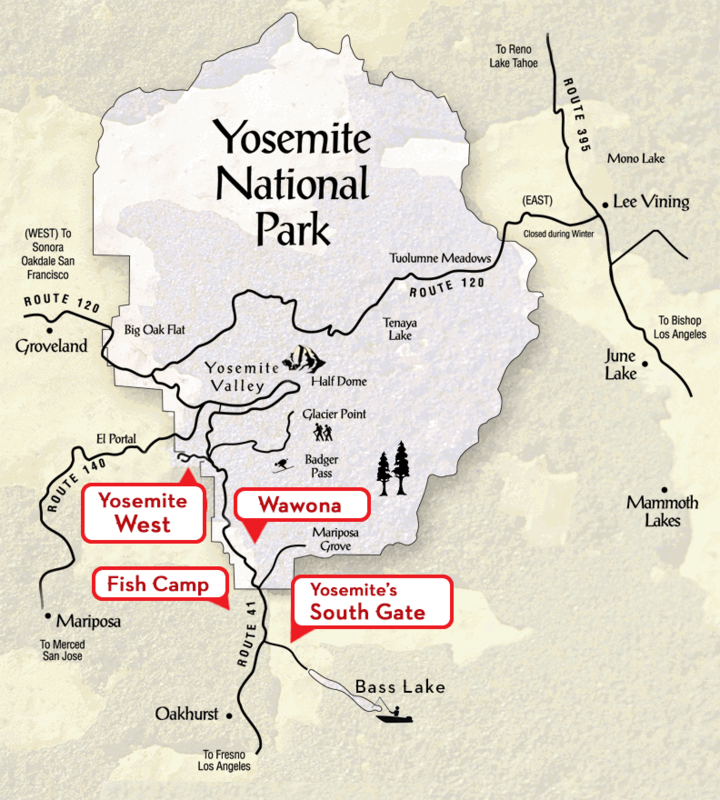 Camping is allowed only in specified camping areas in Yosemite Valley, not in Yosemite West. You will need to contact (209) 372-0200 for campgrounds information. Yes - there is a 10% bed tax fee, plus a 1% tourism assessment fee, total 11% County tax, that helps pay for the management and upkeep of the Counties infrastructure and government. Please do note, that unlike some of our competitors, we do not charge cleaning fees; however, a two-night reservation deposit is required when you confirm your reservation. Excessive mess or damages to property shall result in additional charges. Be sure to read the check out procedures thoroughly to avoid any additional charges.